Creative Team Member Donna Mikasa spotted this fun card on Instagram and followed it to Gladys's blog. Donna says, "I just love how she incorporated a shaker element in the waves! She mentioned it took her awhile to put it together, but the final result is so worth it!" Such a fun card using our Soak up the Fun stamp set, Whimsical Waves Background stamp, and Stitched Whimsical Waves Die-namics! 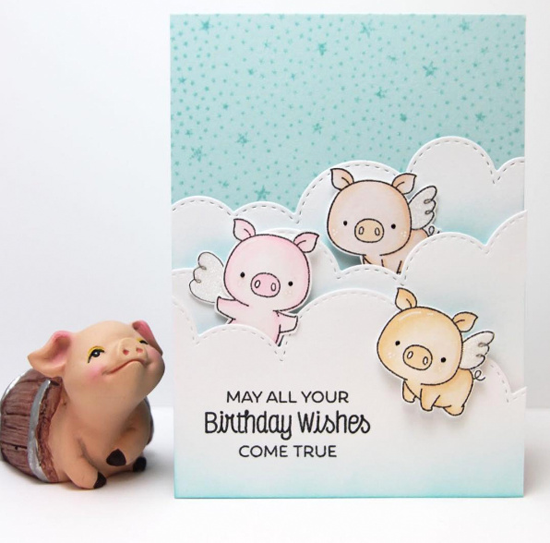 Three adorable pigs from the Hog Heaven stamp set are all gathered together on Vera's card for a delightful birthday greeting. Vera added a hand-drawn wing to the pig on the left! So CUTE! Karen created this card in answer to one of the creative challenges issued during our second session of Camp Create — Coloring on Kraft. 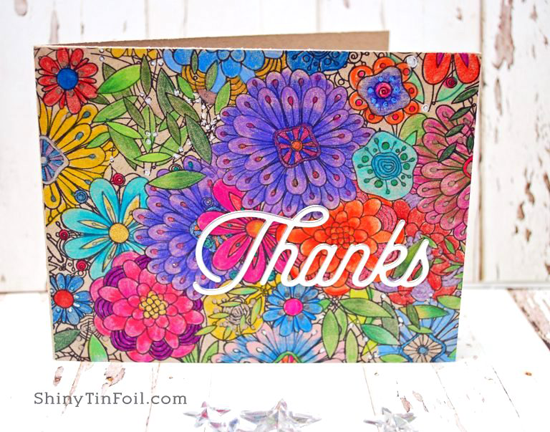 The Bundles of Blossoms Background stamp looks absolutely divine with her coloring! This stamp, as she says, is perfect for coloring while watching TV. Creative Team Member Joy Taylor says she, "Found this cutie on Pinterest and went over to Annett's blog to check it out. Simply adorable." 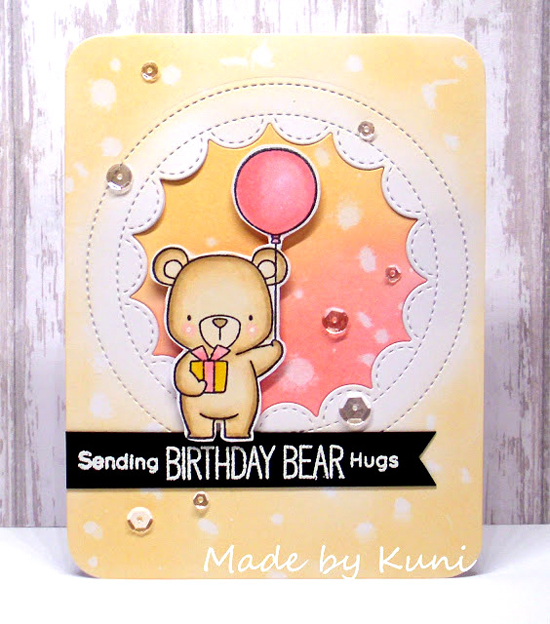 Those little rosy cheeks on the gift and balloon-bearing cutie from our Beary Special Birthday stamp set are just delicious! 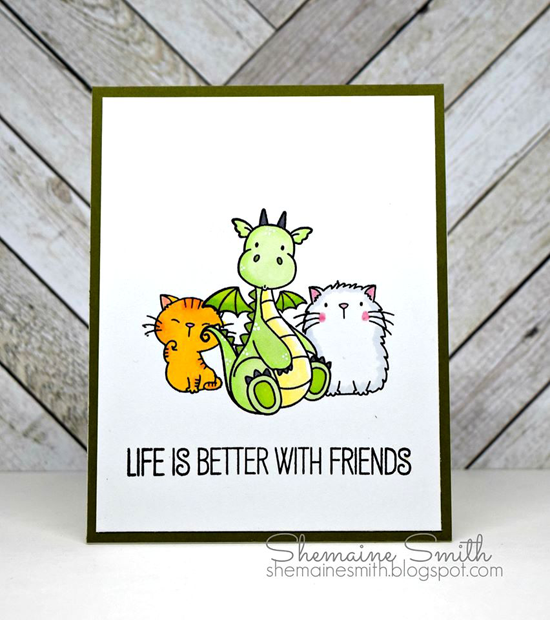 Shemaine joined the fun at our Camp Create Farewell Bonfire and created this inventive card in answer to the Single Layer Savvy challenge. I love how she used three of our sets to make one adorable and seamless design. Thanks for using MFT, ladies! You've left us inspired, and that's what it's all about! See you tomorrow for another great Sketch Challenge, and look for the next MFT Color Challenge on Thursday, September 8th. Awesome cards, ladies! Well done on being spotted! Thank you for chossing my card, i so happy. thanks for choosing my card. I was so excited to see it here. Everyone's card is awesome. A real privilege to be amongst these talented folks. Such sweet cards - love seeing who's spotted each week - gorgeous inspiration thanks girls.